In 1839, a German mineralogist named Gustav Rose described a new mineral in samples provided to him by a Russian mining engineer named Samarsky-Bykhovets. The mineral was eventually named samskarite after its discoverer. When French chemist Paul Emile Lecoq de Boisbaudran isolated an oxide of a new element from the mineral in 1879, he named it after the mineral, making samarium the first chemical element to be named, if somewhat indirectly, after an individual. Though the pure metal could not be easily obtained in quantities sufficient for commercial use until the 1950s, a byproduct of the purification of other rare earths with a high percentage of samarium did find early use in control rods for some of the first nuclear reactors. Today samarium is used in a number of applications, the most significant of which is high-strength samarium-cobalt magnets. These magnets are slightly surpassed in strength by neodymium magnets, but are preferred in some applications due to their ability to maintain their magnetic properties at significantly higher temperatures. These magnets are frequently found in small motors, speakers, and other electronic devices. Another significant commercial use is catalysis. Samarium catalysts are used in a variety of industrial processes including decomposition of plastics, dechlorination of pollutants, and dehydration of ethanol. Additionally, a variety of samarium compounds are used as catalysts and reagents in organic synthesis. Samarium can be also be used to provide useful properties to a substrate material such as glass when added in small quantities during production, a process often referred to as doping. Samarium oxide is added to ceramics and glasses to increase absorption of infrared light. Samarium-doped crystals have been used as gain media for lasers since the one of the first solid-state lasers was produced by IBM research labs in 1961, and in 1997 a samarium-based gain media was used to produced the first saturated x-ray laser. Several specific isotopes of samarium have specialized uses. The radioactive isotope samarium-153 is used in the treatment of some advanced cancers, as it naturally localizes to the bones and emits beta particles that kill the nearby cancer cells, lessening the extreme pain of bone metastases. Samarium-149 is notable for being an excellent absorber of neutrons, and is used in this capacity in the control rods of nuclear reactors. Additionally, relative ratios of samarium-147 and its decay product neodymium-143 can be measured and used to estimate the age of objects that are billions of years old. Finally, there are a number of samarium applications still under development. A group of compounds called samarium monochalcogenides are crystalline semiconducting solids with interesting properties. In particular, the electrical properties of the solids change depending on the pressure applied to the material, and the material generates electric voltage when heated. These unique phenomena are being investigated for use in pressure sensors, memory devices, and thermoelectric power converters. Samarium can be used in the production of superconducting materials, and samarium-doped iron superconductors are among the highest-temperature superconductors known. Samarium-doped cerium oxide nanostructures are of interest for use in solid oxide fuel cells. Samarium is a rare earth element and is found along with other elements of this group in a variety of rare earth minerals. The primary commercial sources are the minerals monazite and bastnasite. Samarium is primarily utilized in the production of samarium-cobalt (Sm2Co17) permanent magnets. It is also used in laser applications and for its dielectric properties. Samarium-cobalt magnets replaced the more expensive platinum-cobalt magnets in the early 1970s. While now overshadowed by the even stronger neodymium-iron-boron magnet, they are still valued for their ability to function at high temperatures. They are utilized in lightweight electronic equipment where size or space is a limiting factor and where functionality at high temperature is a concern. Applications include electronic watches, aeospace equipment, microwave technology and servomotors. Samarium is available as metal and compounds with purities from 99% to 99.999% (ACS grade to ultra-high purity). Elemental or metallic forms include pellets, rod, wire and granules for evaporation source material purposes. Samarium oxides are available in powder and dense pellet form for such uses as optical coating and thin film applications. Oxides tend to be insoluble. Fluorides are another insoluble form for uses in which oxygen is undesirable such as metallurgy, chemical and physical vapor deposition and in some optical coatings. Samarium is also available in soluble forms including chlorides, nitrates and acetates. These compounds can be manufactured as solutions at specified stoichiometries. Samarium is a Block F, Group 3, Period 6 element. The number of electrons in each of Samarium's shells is 2, 8, 18, 24, 8, 2 and its electron configuration is [Xe]4f6 6s2. The samarium atom has a radius of 180.pm and its Van der Waals radius is 229.pm. In its elemental form, CAS 7440-19-9, samarium has a silvery-white appearance. Samarium was discovered and first isolated by Lecoq de Boisbaudran in 1879. It is named after the mineral samarskite. Samarium is somewhat toxic. Safety data for Samarium and its compounds can vary widely depending on the form. For potential hazard information, toxicity, and road, sea and air transportation limitations, such as DOT Hazard Class, DOT Number, EU Number, NFPA Health rating and RTECS Class, please see the specific material or compound referenced in the Products tab. The below information applies to elemental (metallic) Samarium. 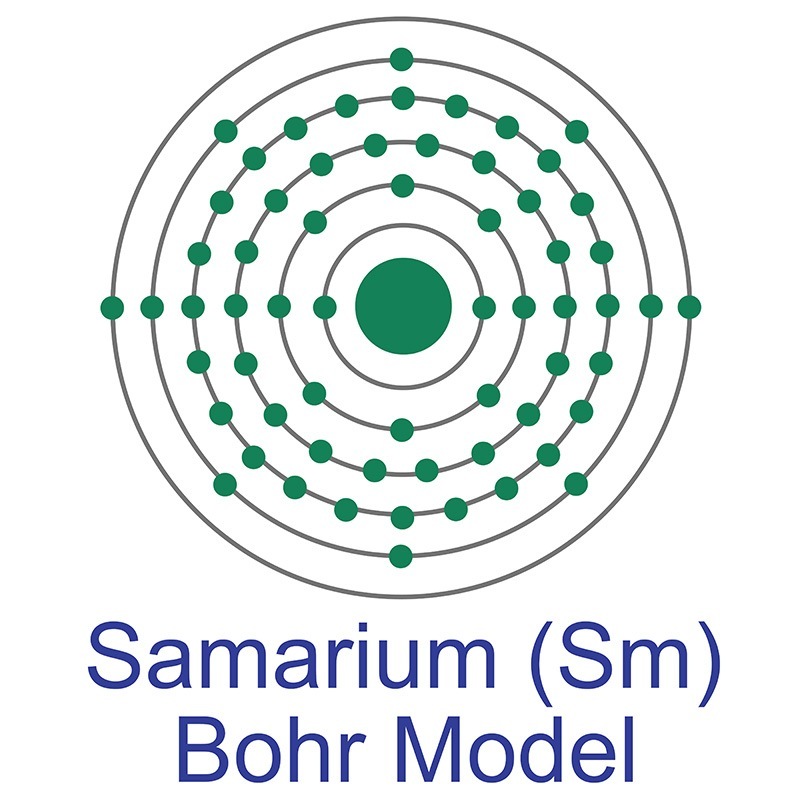 Samarium (Sm) has five stable isotopes: 144Sm, 149Sm, 150Sm, 152Sm and 154Sm.